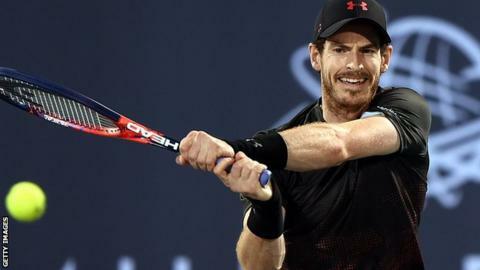 Andy Murray lost a one-set exhibition match in Abu Dhabi after stepping in as a late replacement for Novak Djokovic. Murray intended only to practice as he recovers from a hip problem but agreed to replace Djokovic after the Serb withdrew due to an elbow injury. The Briton lost the first four games against Spain's Roberto Bautista Agut before he was able to hold his serve. Murray looked better as the match went on, saving three match points before Bautista Agut registered a 6-2 win. The British number one was forced to end his 2017 season early because of his hip trouble and has not played competitively since Wimbledon. "When you haven't competed for a long time it takes time to get back up to that pace. I started to feel a bit better at the end," Murray, 30, told Eurosport. "I'll need to keep improving, for sure. It was good fun. I've missed it." He travelled to the airport after the match for a flight to Australia on Friday evening, where he is scheduled to appear at the Brisbane International. Murray, who has a first-round bye, has been drawn to play Ryan Harrison or Leonardo Mayer in the second round at a tournament intended to act as part of his warm-up for the Australian Open, which begins on 15 January. The former world number one ended his frustrating 2017 season in August when he withdrew from the US Open due to his hip. He played Roger Federer in a charity match in November, and is scheduled to appear at the Brisbane International, which begins on New Year's Eve. The Scot, who has slipped to 16th in the world rankings, looked understandably rusty as the match began, and struggled with his serve. He served up four double faults and looked uncomfortable moving to his forehand side. Bautista Agut raced through the opening four games and had a chance to make it 5-0, but a net cord fell Murray's way. Murray grew more comfortable as the match progressed, moving up to the net and stretching to reach a volley, while several of his ground strokes were powerful. In a game lasting just under 13 minutes, Murray served two aces to save two match points, before Bautista Agut netted his return to a serve out wide. However the Spaniard, who beat Andrey Rublev on Friday, served out the match to secure his place in Saturday's final against Kevin Anderson of South Africa.